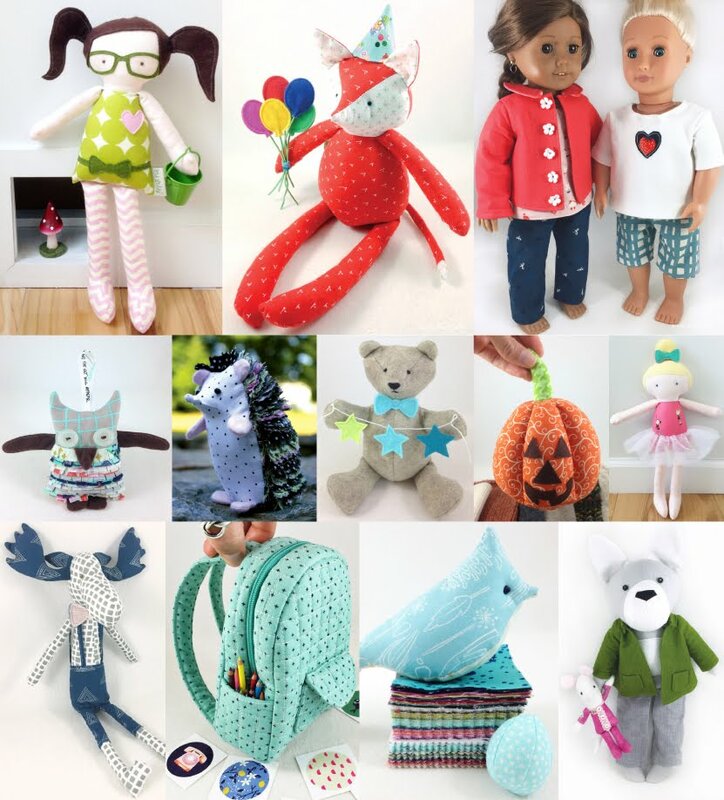 As a member of the Designer Crafts Connection, I have the privilege to work with some really fun toys (aka products), sent to me from the manufacturers. I was grateful to be one of the 8 chosen to this month and was given a Flip Pal™ Mobile Scanner to play with and use at my discretion. Of course with Christmas on my mind already, I decided to deck the halls on this post! After all, it is my favorite time of year! 10 years ago, my husband and I got married. Just over 8 years ago we had our first baby. Almost 7 years ago we had our second, and in a few months, 7 years ago we got our first digital camera. It's so hard to believe that only 7 years ago I was still taking my "film to be processed and printed". Now with everything going digital the opportunities for creative endeavors are endless. 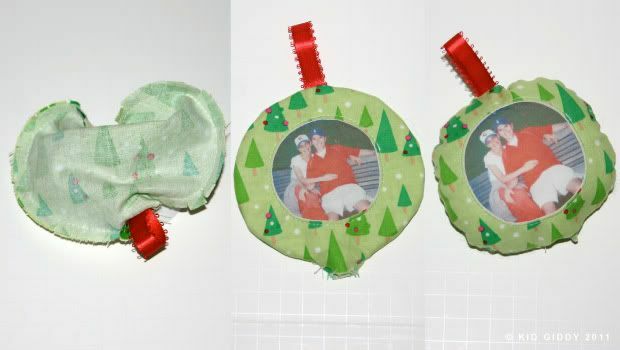 I made some really fun ornaments with pictures I have been needing to scan, from my wedding and of my newborn babies! 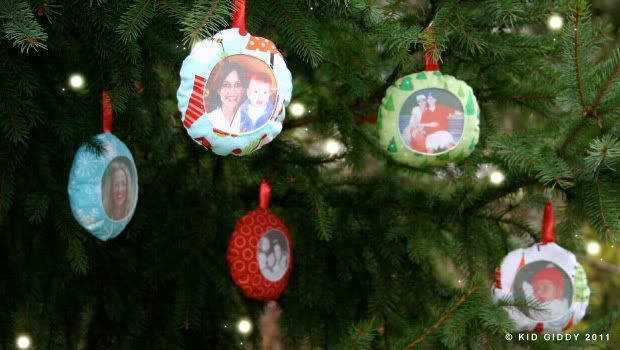 These ornaments are so quick and easy to make, and are great for gift giving! 1. Read all the instructions on the Flip Pal™ Mobile Scanner prior to using (so that you have enough batteries and can decide things like scanning at 300dpi or 600dpi). Scan all the photos or objects you'd like to use. If you don't want to purchase holiday fabric, you can make your own fabric, by scanning your favorite patterned sweater for a really great texture and printing that as well. 2. If you can't take the picture out of the book, or if you can't fit the object on top of the scanner, remove the cover, flip the scanner and scan the photo directly in the book, or directly over the item. I love this option, as it really gives you so many ways to use it while scanning a variety of things. 3. 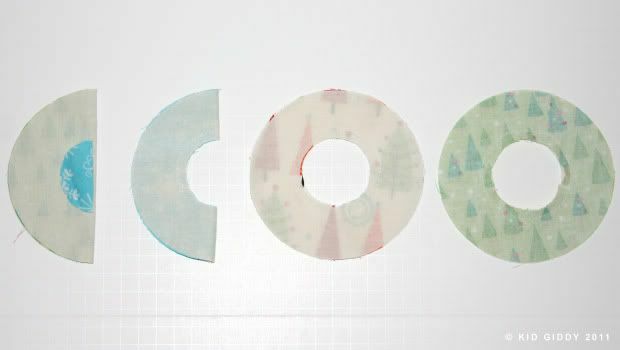 Using a die cut machine or template cut out three large circles (2 of your chosen fabric, and 1 Muslin) that are 5" in diameter, and one small 2" circle from a scrap of fabric. 4. 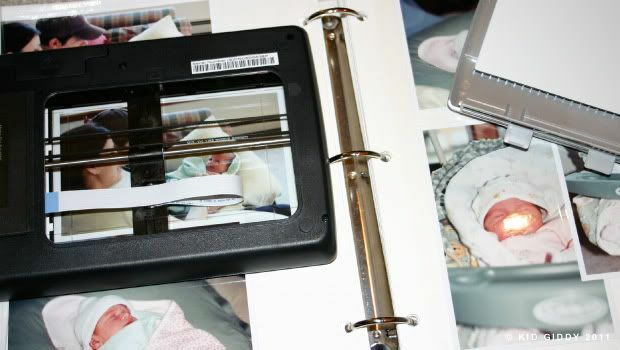 Once you have scanned all of your photos, you can use the computer program of your choice, to prepare and crop them for printing. I placed each photo into a circle shape on my MAC program, to avoid using more ink than needed. You don't have to do it that way. 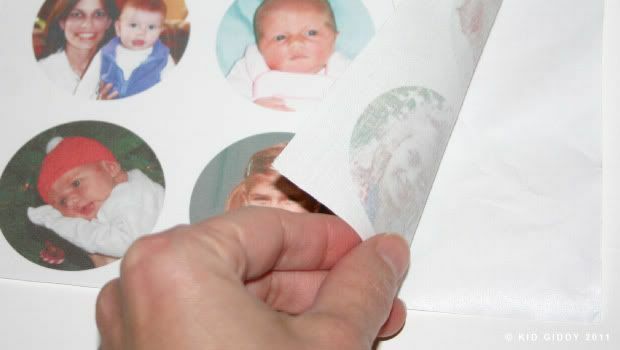 You can just print each picture and crop during the sewing process. If you print them as circles, they should be no smaller than 3" in diameter. Peel the fabric, carefully, from the paper backing. Make sure you do not pull or distort the images by pulling too hard in one direction. 5. Lay one of the holiday fabric circles right side up, and one piece of muslin on top of it. Fold it in half (as show on the left side of the group). Fold the smaller 2" circle scrap and center it. 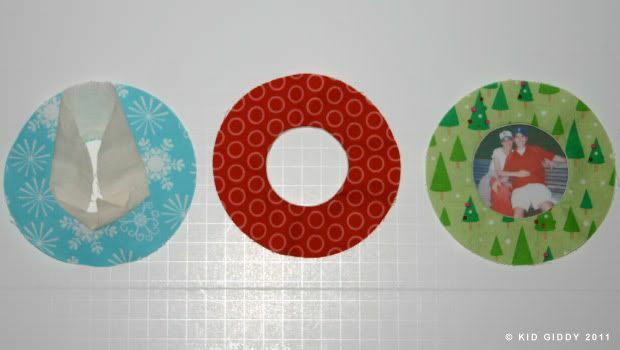 Cut out that half circle, so you have a 2" opening in the center of your ornament. Sew all the way around the center of the circle, using a 1/4" seam allowance (3rd photo from left). 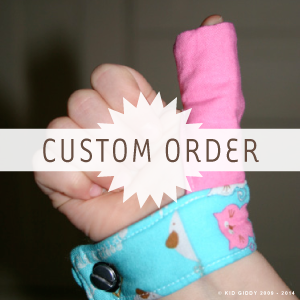 Now clip all the way around the inside edge of the circle, making sure to not cut the seam. 6. Once you have clipped the inside edge, flip the muslin inside through the center, and behind the front piece. This will give you the clean edge that you need in the center of your ornament. If you prefer a raw edge, you do not need to use the steps involving the Muslin. 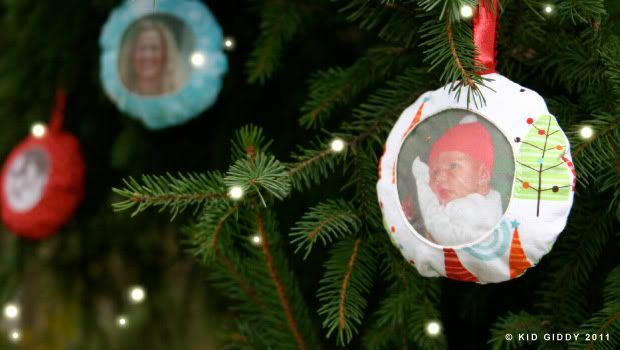 As pictured on the far right, place your photo underneath the ornament fabric. 7. Next, top stitch around the inside edge of the ornament. With raw edge to raw edge, place a piece of ribbon in the top, center of your ornament. Cover the ribbon, and front of the ornament, with the back piece of the ornament. Leaving the bottom open about 1", sew all the way around the outside edge, using a 1/4" seam allowance again. 8. Clip a notch (small triangles not shown) all the way around the edge of your ornament, again making sure not to cut the seam. Gently pull the ribbon out from the bottom opening, and turn the remainder of the ornament inside out. 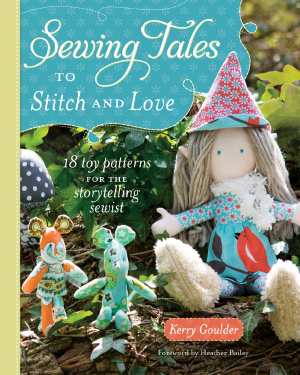 Gently stuff the ornament with desired fiberfill and stitch closed with a needle and thread. 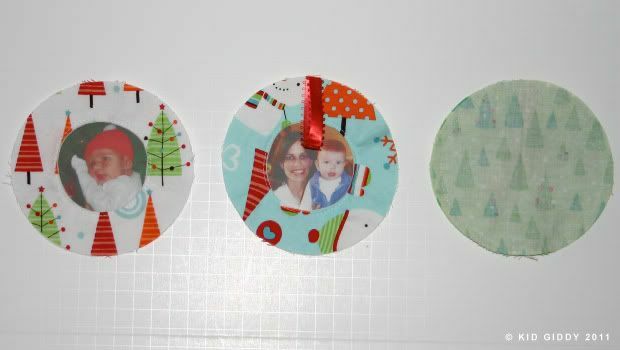 These ornaments are so quick and easy to make, they would be perfect for gift tags and gift giving this holiday season. So you can make as many as you'd like. And now you'll have to hop around to see all the other amazing projects made with the FlipPal, and some other projects by the other members of the Designer Craft Connections Blog Hop (see the link below). Thanks for visiting and don't forget to click the follow button, on the right side, and sign up for the Kid Giddy email updates! After making some ornaments of your own, please feel free to share them on the Kid Giddy Flickr group! Have a wonderful week! This pattern is copyright protected and is for home and personal use only. The opinions set forth regarding the FlipPal™ Mobile Scanner, and any other products, are my own opinions. 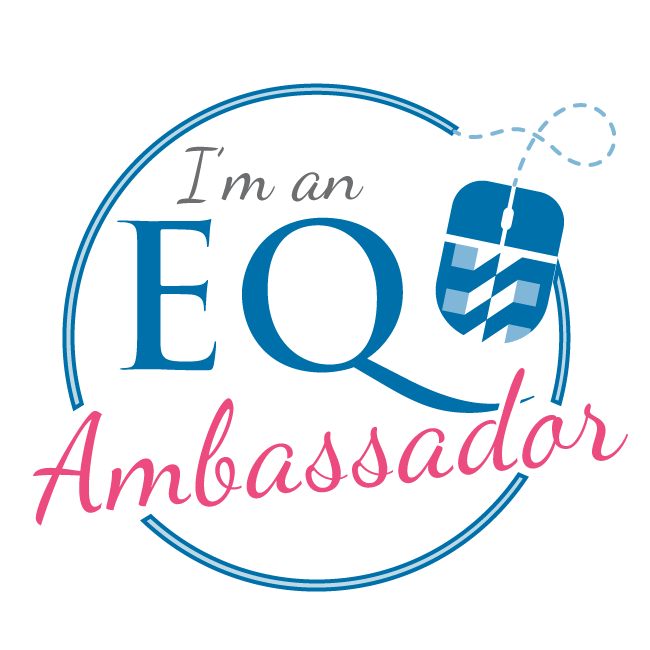 You can participate too! The blog hop follower and participating Scan & Share Blog Hop designer that creates the most creative and productive ideas using a Flip-Pal™ mobile scanner will each win a Flip-Pal™ mobile scanner. 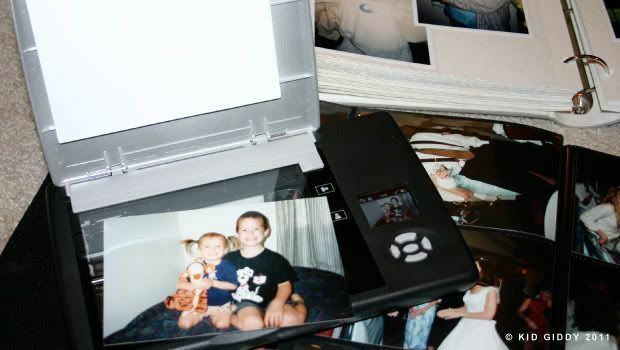 Do you have a creative idea for using the Flip-Pal™ mobile scanner for a Scan & Share project? Enter your idea by clicking this link here. Entries are due by Dec 15th, 2011. A team from Flip-Pal™ mobile scanner will choose the winners—who will be announced on Monday, December 19, 2011. And there's more...The Flip-Pal™ mobile scanner team is also offering a coupon for 10% off the purchase of a Flip-Pal™ mobile scanner or a Flip-Pal™ mobile scanner Creative Suite—with Craft Edition DVD. 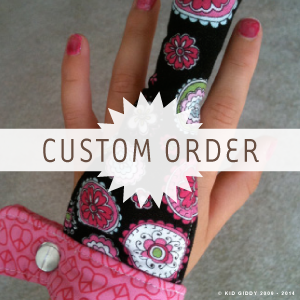 To receive a coupon code click here. The coupon is valid from Nov 15 - Dec 14, 2011 or while supplies last! I've been sitting at my computer for way too long, doing absolutely nothing of worth. I feel like I'm toast. I've been sewing like crazy, to get my goods in a local shop, made some costumes (still need to post those pics) and volunteering at my daughter's schools. Some days I have a blog post idea, but I know it will take at least an hour or longer, and then lose my motivation. Then there's the having to sew, in which case, I'd shut down my computer just to stay off of it! I have so much to share with you, and no time to do it. But have no fear, this weekend I will be going through much of my blog re-design process and hope it will be finished by Monday. I can't wait to show you what I've been up to lately, and hear your thoughts on the fresh, new, kid giddy blog look!